The story needs little introduction… Japan’s favourite monster invades Tokyo and the country scrambles to destroy it. It’s all about Japanese style disaster movie which don’t always appeal to foreigners, but I like it since my childhood days. Despite its destructive nature, the gigantic creature actually saved the world in some of the films, including in the American remake in 2014. The plot for Shin Godzilla seems a bit typical though because it’s a fresh reboot. Hideaki Anno is best known for creating Neon Genesis Evangelion, a popular and iconic anime series. While Shinji Higuchi is famous for his special effect works; his recent production includes the live action adaptation of Attack on Titan. Record producer Shirō Sagisu composed the film’s score. It’s worth mentioning because he also scored the two works mentioned above. The basis of the music in this Godzilla trailer was used since the first movie in 1954, the new one is heavily rearranged though with the opera style etc. 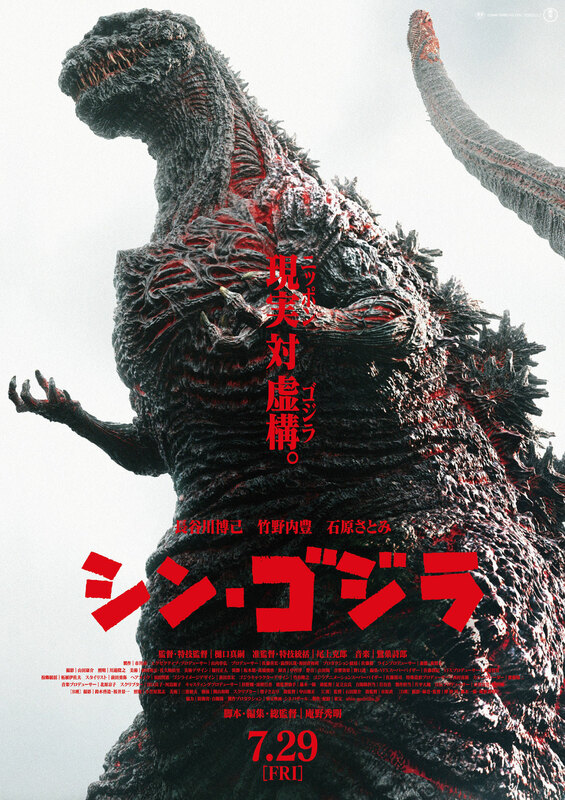 The tail is a prominent feature in the design of Shin Godzilla. It’s larger than its predecessors and has that eerie face-like shape on its tip. Not sure if it does anything, seems like it may be able to shoot a laser beam or something LoL. Speaking of size, this Godzilla is the tallest to date. At 118.5 metres it’s 10 metres taller than its American counterpart in 2014. It may weigh less though as the American one is infamous for being “too fat” among fan community. The 2016 film stars Hiroki Hasegawa, Yutaka Takenouchi and Satomi Ishihara. It features many cameos and supporting appearances, e.g. Kengo Kora, Ren Osugi, Akira Emoto, Jun Kunimura, Kimiko Yo, Kanji Tsuda, and Mikako Ichikawa etc. Famous stage actor Mansai Nomura portrayed Godzilla through motion capture. [Update] Shin Godzilla is the highest grossing live-action Japanese movie of 2016. The film also won seven awards at the 40th Japanese Academy Prize, including the Picture of the Year and Director(s) of the Year.